Ahead of today's jobs report, Nomura's Bilal Hafeez summarized the worst case scenario as "weak employment but high wage growth." And moments ago, we got one half of this scenario materializing when the BLS reported that in September only 134K jobs were added, well below the 185K expected (and certainly far lower than the 500K print implied by the latest ISM nonmfg report). This was the lowest print going back to March 2017 when only 50K jobs were added. However before traders panic, note that this number was impacted by the Hurricane: the BLS noted that 299,000 people were not at work due to bad weather, which is over 200K higher than the 85K average for September. Another 1,489K workers who usually work full-time could only work part-time due to the weather last month. This means that next month, the September job report will be revised sharply higher. 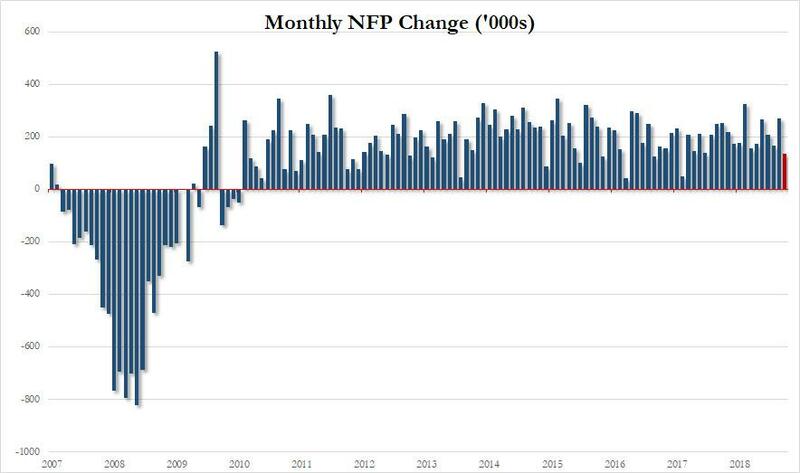 Meanwhile, offsetting the September weakness was the revision to the August jobs report, which was pushed higher from 201K to 270K, while July was revised from 147K to 165K. With these revisions, employment gains in July and August combined were 87,000 more than previously reported. Even as payrolls missed, the unemployment rate ticked lower again, sliding from 3.9% to 3.7%, below the 3.8% consensus estimate, and the lowest print in 48 years. 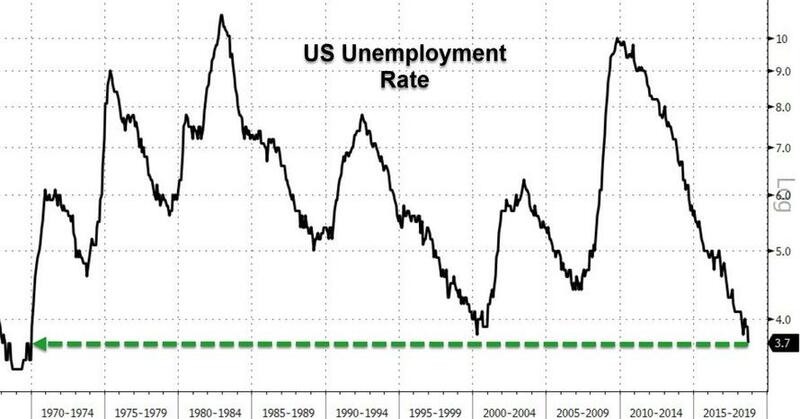 Also of note: the Unemployment rate has now hit the Fed's year end projection of 3.7%. The central bank recently estimated that unemployment would fall to 3.7% in the fourth quarter, which is where we are now, then decline to 3.5% in 2019 and remain there in 2020. 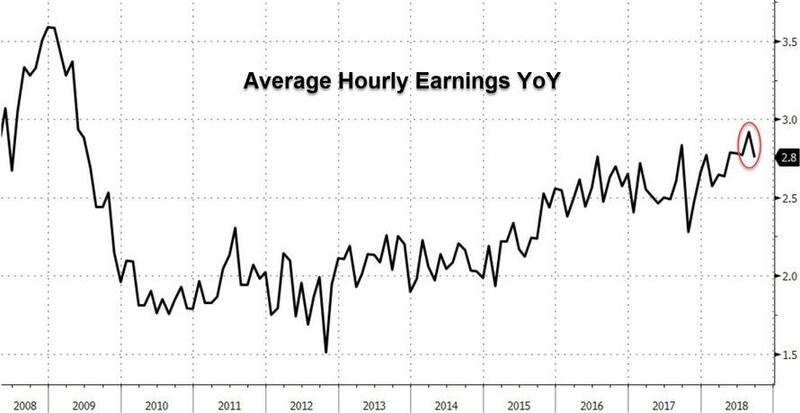 The more important average hourly earnings print came in line, with wages rising 0.3% on the month, and 2.8% on the year, both in line with expectations. According to Bloomberg, "the tick down in average hourly earnings suggests that wage pressures remain modest, a sign that firming inflationary pressures are likely still a way off." Average hourly earnings of private-sector production and nonsupervisory employees increased by 6 cents to $22.81 in September.